One of my personal favorites, via HyperGalaxies on Twitter. Final Fantasy XV’s multiplayer expansion, Comrades, launched this week, and players have been putting its ridiculously detailed character creator to good use. Because four pretty people wandering the countryside fighting monsters is never enough, Comrades gives players the chance to create their very own Glaives, elite soldiers tasked with looking pretty damn good. The character creation tool does a good job of making that happen. While players who aren’t picky about their appearance can breeze on through and come out the other end with a decent avatar, the more meticulous can adjust everything from body size down to eye spacing. It’s hard to make an ugly character. I tried. Mind the blown-out screen, Xbox One X is still waiting on an update to fix captures taken with HDR on. He’s tubby, his hair line is receding and he’s got a bald spot, but he still looks better than any tubby, balding guy I look at in the mirror every day. Most of the creations I’m seeing posted to Twitter and Reddit are downright gorgeous. Some are original creations, like this one from Redditor Explodinhater. Now that I squint she looks a little Paris Hilton-y. 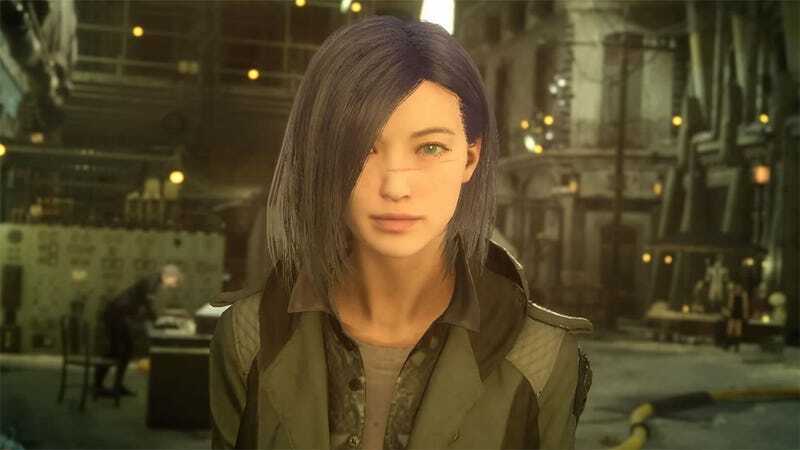 Other are attempting to use the tools Square Enix has given to recreate familiar faces. PerfectChaos86's recreation of Faith from Mirror’s Edge is outstanding. Zhire653 perfectly captured Annie from Attack on Titan. And you can’t swing a giant sword around without hitting a Lightning, like the one here by HeroOfTime_99. And there are pretty guy characters as well. AkuRyuZaki did a pretty great Dante. And here’s a deep cut—GladwinWright used tattoos to create a passable likeness of Demi-fiend, the protagonist from Shin Megami Tensei III: Nocturne. The cool thing about these custom characters is that the more players play, the more accessories and outfits are unlocked. Sometimes all it takes to make a character perfect is a nice pair of glasses, as Twitter’s Miraculous Maku discovered. We’re sure to see more amazing characters popping up as players dive deeper into Final Fantasy XV’s Comrades multiplayer expansion. If you’ve made or seen an avatar you love, be sure to share it in the comments.